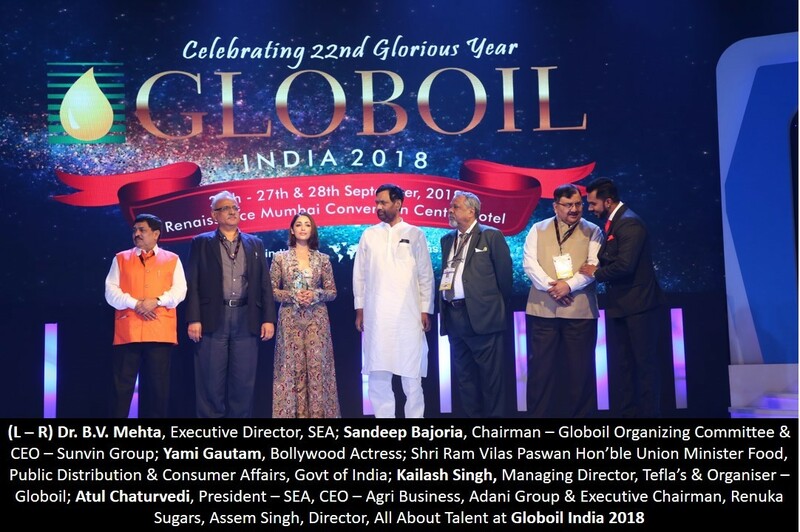 Mumbai: Three days Globoil India international conference on edible oil was held in Mumbai.The event was inaugurated by Ibu.Ir. Musdhalifah Machmud, Dy Minister for Food and Agriculture Coordinating Ministry for Economic Affair, Govt of Indonesia on 27th September at Renaissance Mumbai Convention Centre Hotel, Mumbai. Ram Vilas Paswan, Union Minister Food, Public Distribution & Consumer Affairs, who was the chief guest in the second day of the conference, said, “The central government is committed to protect the interest of farmers and consumers, and the central government has decided to give major relief to sugar growers in the sugar industry and to eradicate the slowdown. Food package will be implemented soo. “Sugarcane production subsidy has been increased to Rs. 138.80 per ton, more than doubling of rupees 55 per ton during the upcoming sugar season. It also plans to export at least 50 lakh tons of sugar from the country next year. Proposals have been taken to fulfill this and for the export of sugar, a subsidy of 2500 to 3000 rupees will be given”Mr. Paswan added. “The fast-moving consumer goods sector is doing well. The rural market is growing better than the urban one. The biscuit industry is Rs 32,000-crore market now. The snack market will continue to grow”. “Edible oil has witnessed a shift from loose to packaged oil. The demand for value-added products and premium products is increasing. E-commerce can be a challenge, but it also has some benefits.” Said Hemant Malik, Chief Executive Officer, ITC Foods.